Why the Lawless One is Not likely to be a Jew or a Jewish Zealot. Preterism, The Lawless One of 2 Thessalonians 2 is Not A Zealot Leader: Why the Lawless One is Not likely to be a Jew or a Jewish Zealot. Assuming that the Lawless One is a Jew, some preterits have posited a variety of Jewish Zealot contenders over the years. Let’s assume for a moment that the Lawless One is actually a Zealot leader and this individual stood in the Temple proclaiming himself to be God. Imagine if any of the other Zealots caught wind of this fact, this person would have likely been murdered or at least deposed. Even wicked Jews like the Zealots would not likely tolerate this kind of blasphemous arrogance. 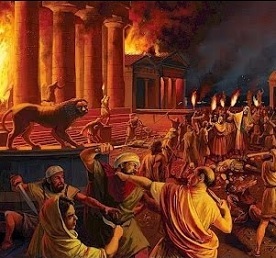 One possible candidate for the Lawless One is Eleazar b Simon as he held the Temple briefly during the revolt. However, not only is it not known when Eleazar died, Eleazar also opened the Temple gates of the innermost court of the Temple during the feast of unleavened bread to allow people to worship knowing this would allow his enemies, John and his army, to enter. If Eleazar had this kind of reverence for God’s laws knowing that by doing this he would certainly lose his authority and possibly his life, it is highly unlikely this man proclaimed himself to be God as the Lawless One is said to do.